BISHOFTU, Ethiopia, Oct 13 2012 (IPS) - China could soon expand its involvement in peace and security issues in Africa, according to government officials, researchers and academics from both the Asian giant and resource-rich continent who met at the second China-Africa Think Tanks Forum in Ethiopia from Oct. 12 to 13. Mulugeta Gebrehiwot, the director of the Institute of Peace and Security Studies in Ethiopia that organised the forum, told IPS that it should not come as a surprise that China is interested in peace and security on the African continent. “There is nothing that is not touched by peace and security. Whether you’re (looking) for investment collaboration, economic operation or anything else. Peace and security has to be in place. Because that’s the central instrument that keeps the environment for any other interaction and collaboration together,” Gebrehiwot said. Senior officials and prominent scholars including Ethiopia’s Deputy Prime Minister Demeke Mekonnen and vice-president of the China Foreign Affairs University Professor Zhu Liqun attended the forum in Bishoftu, some 45 kilometres from the country’s capital, Addis Ababa. Chinese officials pointed out that the Asian giant’s non-interference policy should not be interpreted as indifference to the continent’s peace and security. “Our non-interference policy in Africa does not mean we have an indifferent attitude towards African issues. We oppose some countries that in the excuse of care for another, interfere with African internal affairs,” Director-General Lu Shaye from the Department of African Affairs at the Chinese Foreign Ministry told IPS. He said that China would not intervene readily in the affairs of another country and their involvement would be to merely support regional organisations and institutions on the continent. “In the past we provided funds to support the African Union (AU), in the future we will strengthen this support. We’ll have cooperation with the AU and other regional organisations to have a better understanding on this issue. And we will accelerate our support to the AU and other regional organisations,” Lu Shaye said. Until now, China’s role in Africa has mostly focused on economic development. Last year, China-Africa trade amounted to 166 billion dollars, according to statistics from the Chinese Ministry of Commerce. China’s approach of non-interference has provided Africa with much needed funding without the strings that some western powers attach to loans for Africa, and has resulted in the fast construction of large infrastructure projects, according to experts. A research article in Standard Bank’s Guide to Transactional Banking in Africa 2012 by Bridgette Liu and Richard Stocken titled “The role of China’s construction industry in Africa’s infrastructure development”, stated that Chinese companies now dominate the African construction sector, with a market share larger than those of France, Italy and the United States combined. 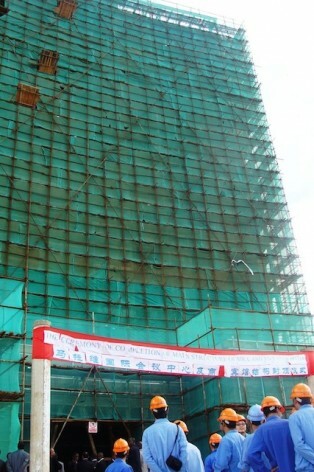 “Revenues of construction companies in central and southern Africa grew by 31.7 percent to 27.52 billion dollars in 2009. North Africa grew 30.8 percent to 29.29 billion dollars. At the same time, the share of Chinese enterprises in the African market rose significantly from 26.9 percent in 2007 to 42.4 percent in 2008 and back to 36.6 percent in 2009,” the article stated. China’s President Hu Jintao announced two months ago that his country would invest 20 billion dollars more in Africa. But he also stated that China would take new measures to support the cause for peace and development in Africa. Policies are already being drafted to indicate how China will improve is participation. While China is Africa’s biggest trade partner, it already is the largest contributor of peacekeepers to Africa among permanent members of the United Nations Security Council. But the role of China in Africa is often seen as a controversial one. China’s funding of the new AU building headquarters in Addis Ababa has sparked debate among non-African critics about whether the new economic world power was buying its way into the continent. Western countries have warned on frequent occasions that China’s participation in Africa has colonial tendencies. Or that the Asian country supports oppressive regimes and is trying to take advantage of Africa’s natural recourses. However, Dr. Mehari Taddele Maru, an independent peace and security expert in his conference paper titled “China-Africa Relations: Areas of Reform for a Sustainable Partnership”, disagreed and stated that China’s reputation in Africa is positive as African countries feel that their Asian partners respect other people, cultures and states. While China’s improved role in peace and security in Africa could be beneficial for the continent, it could also be rewarding for China. “China’s cooperation with Africa will become a problem in the future if civil wars continue to exist,” Professor Liu Hongwu, the director of the Institute of African Studies at Zhejiang Normal University, told IPS. Experts at the forum pointed out that peace and security was broader than security focused around violent clashes. It also focuses on food security and fighting the epidemic HIV/AIDS and other diseases. Africans must never be fooled again by sweet words without substance. Since when has the USA government been a friend of Africa? In order to be a friend of Africa, they must first prove to be a friend of African Americans. China has invested in economic development in Africa that create prosperity in many African communities. The response the USA. offered to China’s economic investment is military assistance. In other words, the USA intends to destabilize the regions and then make it appear that they can contain the same area when it was they, themselves who created the confusion in the beginning. Africans must wisely choose China over the USA for it is a no-brainier. China’s investment is a great thing for both, China and Africa. This is where the future is. Of course, the USA will not like this close relationship because it will affect the “give and take” aspect of the USA relationship. In other words, whatever Africa don’t “give” for cheap, they will “take” for free.